Strummer says songwriting is like "going through hell"
BBC News Online's Martin Vennard interviews Joe Strummer at the Womad Festival in the Canaries. Joe Strummer, one time revolutionary rocker and Clash singer, may surprise a few people with his views on the war in Afghanistan. The 49-year-old, who once sang about the Nicaraguan Sandinistas fighting the American-backed enemy, says: "I think you have to grow up and realise that we're facing religious fanatics who would kill everyone in the world who doesn't do what they say. "The more time you give them the more bombs they'll get. Bin Laden is going to try and kill more people." However, he believes there is a link between poverty and terrorism. "It helps the fanatics," he says. And he thinks every artist is going to have to speak through their work about what is happening. Joe Strummer: "We get paid twice as much if we play Clash songs"
Joe Strummer is looking pale and tired after coming off stage in Las Palmas, in the Canaries, where he and his band the Mescaleros were headlining the final day of the Womad Canarias festival. "Singing into a cold wind is the worst nightmare for any singer," he says of the experience. "You could hear it in the voice." Despite that, they were a big hit with the crowd of several thousand, especially when they played powerful old Clash songs, like London's Burning and I Fought the Law. They also played numbers from the new album Global a Go-Go. "We got all the influences for it from Willesden High Road," he says, referring to the multicultural London street where they recorded the album in a studio. "When you go out for milk and cigarettes you go through three countries because all the shops and cafes are playing their own music," he says. He describes the song writing process as "like going through hell". 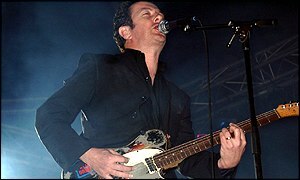 The group opened with a folk-like instrumental from the album, and Strummer points out that he is half-Scottish. The Clash: "Who cares about the past?" Jet lagged, having just flown in from Japan, where his band have been performing, he still cuts it as a rock star, dressed in black, drinking Rioja wine and smoking roll-up cigarettes. Aside from film soundtracks and musical collaborations, his output of three albums since the Clash broke up in 1986 could be described as meagre. But, he says: "It's a good thing to release no records rather than 10 terrible records." He is seen by some as the godfather of punk, but he gives that view short shrift. "Who cares about the past?" And he avoids the question of The Clash ever reforming. "Haven't you heard? Mick Jones has entered a monastery." However, Joe Strummer and the Mescaleros have just played some of The Clash's best-known songs on stage. "We get paid twice as much if we play Clash songs," he jokes, adding: "It's because we like them." He says he makes musical decisions "democratically" with the new group, but his name comes first because "it's difficult to get people to come and see you without a name". He visits southern Spain every year, speaks a bit of the lingo and is well informed about modern Spanish music. He thinks the French group Mano Negra, who sing in Spanish, have the "same force" as the Clash. He enjoyed the Algerian singer Rachid Taha and the Cuban pianist Pepesito Reyes at this year's festival. It is not clear if he is serious when he adds that he would like to work with the veteran French singer Fran�oise Hardy. Regarding the future, he says: "We'd like to be known as one of the good groups from London... I haven't even started yet."